When Annemarie Kill and her husband, John Duffy, bought their first house in Chicago’s Galewood neighborhood in 2003, the duo knew it needed some cosmetic work — in fact, they were excited to redo the bathrooms and kitchen to make the home their own. Little did they realize that the back of the house had been sinking for the last 75 years, and they would spend hundreds of thousands on unexpected construction. Their inspector hadn’t uncovered the rotting wood posts supporting the back of the house; the couple had no idea they’d eventually have to pour in new concrete to fix the issue, or that they’d have to replace the posts and jack up the back of the house a bit each week, causing the new windows and tile floors they’d installed to crack. So when Kill and Duffy — along with their two children, now 11 and 14 — were house hunting in Oak Park in 2014, Kill said, they were determined not to land another money pit. “We got our dream house,” said Kill, a divorce attorney. They got an inspector, too, but didn’t realize they should also consult someone who specialized in fireplace inspections. As it turned out, the lining inside their wood-burning fireplace was falling apart, as was the top of the chimney. If they lit a fire, they could get carbon monoxide poisoning. 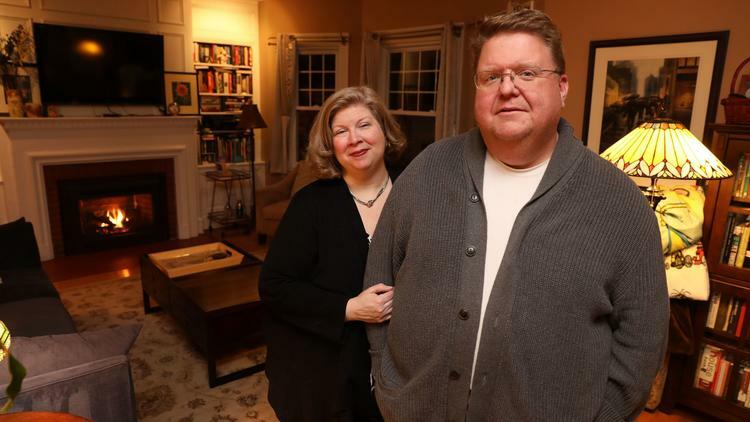 A few months after buying the home — and $20,000 later — Kill, 48, and Duffy, 49, were forced to convert their wood-burning fireplace into a gas fireplace. “It was just like dominoes falling,” Kill said of the fireplace issue. It would be helpful to know about money pits well before you fall in love with a home, spend the money on an inspector — costs vary depending on the size and age of the home and the region, but a typical inspection can ring up between $300 and $500, according to the U.S. Department of Housing and Urban Development — and before you start to take on the major projects. Regular people — that is, those who don’t know anything about construction or inspections — can spot a potential money pit the first time they tour a house. We spoke to realty agents, an inspector and a contractor who shared exactly what to look for. “While many people tend to look at the pretty aspects of a house, there are many issues that can make it a money pit,” said Jerry Grodesky, managing broker at Farm and Lake Houses Real Estate in Loda, Ill. Experts suggest that buyers keep their eyes peeled for these flaws, which hint at more dire problems. Doors that don’t close properly. This — or a crack in the foundation, or uneven steps leading into the home — can signal that the home has settled, and you have an uneven foundation, said Joe Taylor, contractor and owner of Chicago-based Taylor Construction. Most commonly, foundation problems can allow water to easily enter the home, leading to water damage. But an uneven foundation also could mean that the house will need to have concrete pumped into the slab (officially called concrete leveling or mudjacking) to bring the home back up to level and fix the water issues. Pipes also may need to be repaired, along with anything else that is altered during the settling or movement. “It’s a mess,” Taylor said. A cracked foundation could lead to damages that might cost anywhere from a few thousand dollars to more than $20,000, according to Taylor. Discoloration. Water is your home’s No. 1 enemy, said Steve Nations, owner of Nations Home Inspections, based in Oak Park. “If you could keep your house dry, at least the parts that are supposed to be dry, then it’ll last for a long time,” Nations said. “If it gets wet, it’ll go downhill fast.” To easily spot water damage, Nations said to look at all the walls and ceilings, trying to spot any discoloration — yellow spots on a white wall — that might signal a water leak. In the basement, scan the bottoms of walls for any signs of water leaks. While you’re down there, take a deep breath. Do you smell any hint of mold or mustiness? That odor could point to a water problem, Nations said. Bad water pressure. Run the water in every bathroom sink. “Or even better, run the water at the sink and at the tub or shower at the same time,” Nations said. “Is the water pressure good?” Plenty of older houses with old, galvanized steel water pipes have bad water pressure that can only be fixed with a costly upgrade to copper pipes. Uneven stairs. Pay attention to these. In a flight of stairs, all the riser heights should be the same, as should all the tread depths. “In my experience, if the carpenter didn’t get the stairs right, then he probably messed up plenty of other things that are likely to come back to haunt you later,” Nations said. Windows that don’t open. Very old double-hung windows are often hard to open, Nations said. And plenty of casement windows (the kind that are hinged on the side and have to be cranked open) that are only 15 to 20 years old have problems with the crank mechanism that makes them very hard to open and close, he added. Replacement windows can be pricey, costing up to $1,000 each. Dead trees. If any of the trees on the property don’t have leaves in the spring, summer or fall, they may be dead. “Something as simple as a dead tree in a yard in the spring and summer months may not seem like a big deal, but the reason it died could tell another story,” said Kristin Trzoski, realty agent with Prime Real Estate, based in Northwest Indiana. Have beetles or ants taken over the tree? Those have plenty of strength in numbers, and they can put the integrity of the tree in danger, causing it to fall over and cause damage to the home. An arborist should be able to offer a free or low-cost inspection to let you know if the tree needs to go — and why. “Something as simple as knocking down a tree may be in order for a few hundred to a few thousand dollars to prevent future mishaps,” Trzoski said. Also, making sure those insects haven’t infested the home is important, and isn’t always easy to know right away, she said. An uneven floor. Many older homes have uneven floors, which could point to settlement or other issues — even termites, Grodesky said. Typical home inspectors won’t be able to determine the exact cause of the uneven floors. Potential buyers should seek out a structural engineer before purchasing, Grodesky said — that’s the only way to know for certain if there are big problems in store.